Some macaroni and cheeses (macaronis and cheese?) have delusions of grandeur. They boast fancy cheeses. They incorporate hoity toity ingredients like lobster and truffles. Heart Attack Mac is not one of those macaroni and cheeses. Heart Attack Mac just wants to know where to park his double-wide, and when the next episode of “America’s Got Talent” is going to be on. The ingredients are some of the finest in white trash cuisine: Campbell’s soup, Texas Pete, canned milk…VELVEETA. But while its ingredients are humble, the creamy cheesy bliss of Heart Attack Mac is unrivaled. Bring this to a potluck and the other participants will bow down to you and beg for the recipe. It has traveled from coast to coast and back winning raves from all who have tasted and or prepared it. In addition to being delicious, Heart Attack Mac is really quite easy to prepare. Moving on, once you have purchased the Velveeta and other ingredients, you are good to go. Preheat the oven to 325 degrees, and prepare a 13 X 9 X 2 inch baking pan by spraying with Pam. Cook the macaroni (which will be a little more than half a box) per package directions. 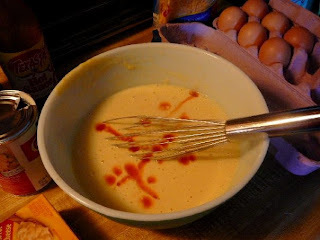 While it is cooking, beat the three eggs together with the evaporated milk and cheddar cheese soup (Yes, I know. Scary. But trust me, it’s worth it) in a large bowl. Add 1c of shredded cheese to this mixture and set aside. 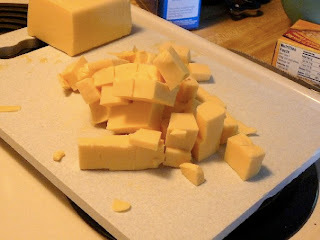 Cut the Velveeta and the butter into small cubes. 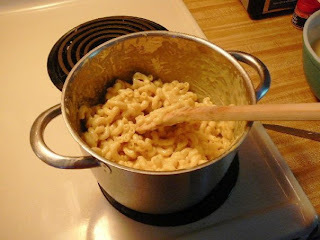 Once the macaroni is done, drain it, put it back in the pot and stir in the Velveeta and butter until both are melted. This will take some effort, but is an important step. You won’t want to come fork to mouth with a big blob of Velveeta later on, you want this to be melted in. Once that task is complete, you will be tempted to just eat it as it is, in all its processed melty cheesy goodness. Don’t do that, it’s worth waiting. 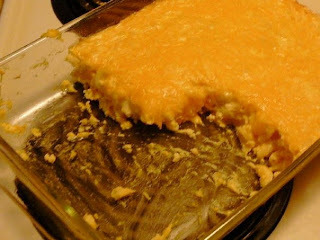 Combine the macaroni/cheese mixture with the egg/cheese mixture in the large bowl and pour into your baking pan. Sprinkle the remaining cup of shredded cheddar cheese on top and cover with foil. Bake covered for 15 minutes. Uncover and cook for another twenty minutes. 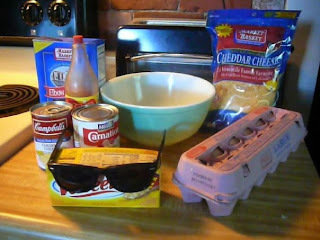 The eggs will have set and cheese will be melted. Let stand for a few minutes before serving. This mac and cheese is best left unadulterated. Attempts to fancy it up with bacon, ham, peas and other ingredients after watching “Food Network Challenge: Macaroni and Cheese” were disappointing. I can report that using the Mexican Velveeta does add a certain je ne sais quoi… (Yo no se que?) , but it’s not as good as the original. This has become a staple in our household – we should probably learn CPR.